Scollah Tukwasibwe and Jenifer Nalimo, both former students of the Potentiam Youth Centre’s Single Mothers Programme (SMP) never imagined the powerful impact their participation would have on their livelihoods. 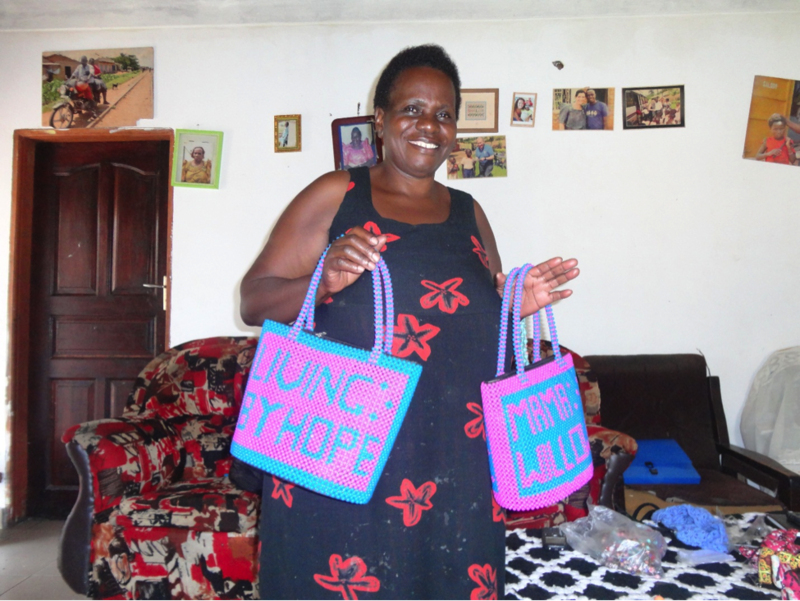 Former SMP participant Jenifer proudly presenting one among MAKULA group’s creative and colourful products. Joining the programme accidentally, they acquired a lot of useful skills e.g. making jewellery, sandals, seat and bed covers as well as growing mushrooms. Inspired by those creative inputs, they gained enough self-confidence and the necessary skills to form the MAKULA group. Together, the members produce bags and jewellery. Owing to the holistic and hands-on teaching approach of the SMP, they did not only acquire the required craftsmanship skills for their business, they also learned how to become successful entrepreneurs with a low start-up budget. 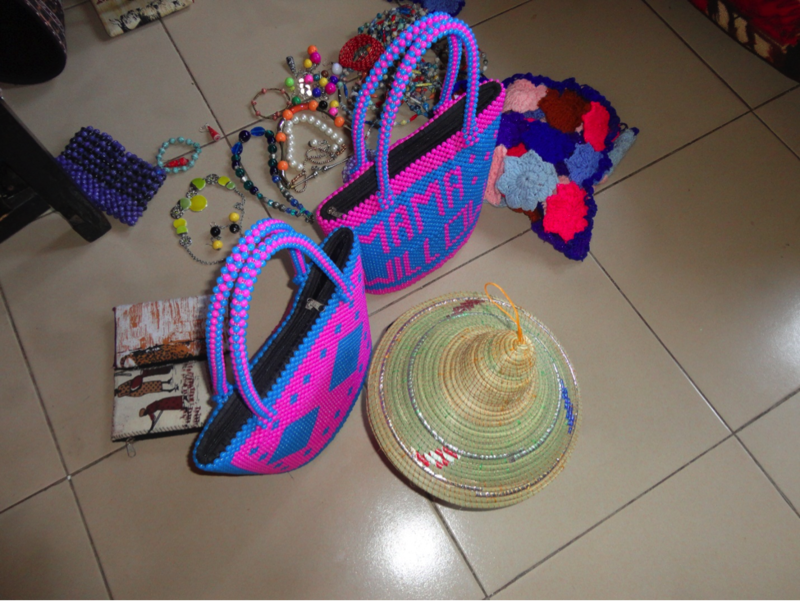 In order to economize on production costs, the group developed creative design ideas, such as making use of different resource materials, as for instance paper, instead of solely relying on the rather costly beads. By carrying out their work from a member’s home, they found a way on how to circumvent the high rental costs for office spaces, so to be able to properly invest the money into those business activities, that need it the most. So far, MAKULA counts 42 full memberships, with 16 active members and it was able to accumulate a promising capital of 720,000 UGX (ca. 200 USD). The founders are very ambitious to further expand their initiative and make it their main source of income. The two former participants are an encouraging example of the positive effects the SMP can have on individual livelihoods. Both of our former students testified that they are really grateful for the opportunity the SMP gave them. ‘Thank you Fontes Foundation Uganda for launching the SMP, because we single mothers have gained a lot from the training. It helped us to earn a small living’ (Jenifer Nalimo, 2015). Through the Fredskorpset (FK) exchange, I have spent six months in Rwanda, learning and generating ideas from the Amizero Training Centre (AMITH). This experience made me not only grow on a professional, but also on a personal level. I quickly realized that the Rwandan people are more reserved as compared to Ugandans. Life is less busy, which I appreciated a lot. I was able to dedicate time to self-study, which turned out to have a lasting impact on my life and the things I value. Learning from Rwanda’s history was an eye opener as well. It made me realize that despite all the bad things that may happen in the world, human beings have the potential to do good and change the destiny of their nation. Today, 22 years after the Genocide, Rwanda is thriving; its economy, infrastructure and government policies are strongly supported by their citizens. Also on a professional level I have experienced various highlights. Since 99% of the staff was older than me, as opposed to my Ugandan staff, I needed to use a different motivational approach to ensure that my team worked favourably with me. Instead of targets and timelines it was mainly respect and appreciation that motivated the AMITH staff the most. During my first month, I underwent a training programme to manage the transition of AMITH from a Vocational Training Center to a Technical Secondary School. By being part of this process I got an in depth understanding on how emerging challenges need to be addressed to ensure a smooth transition. Being responsible for implementing a programme with one of the donor organizations was another highlight. I was able to understand the different aspects of monitoring and evaluation and the importance of effective data collection. I feel that the FK exchange fulfilled my expectations and impacted me in a very positive way. I can now say that I am an evolving Surea, making a difference in the lives of those I meet because of the experiences I have had. From the 20th to the 23rd June 2016, Uganda was hosting the Kampala WASH Symposium, an international conference to improve the global development cooperation in the area of water, sanitation and hygiene with more than 200 participants from 27 countries and 5 continents. 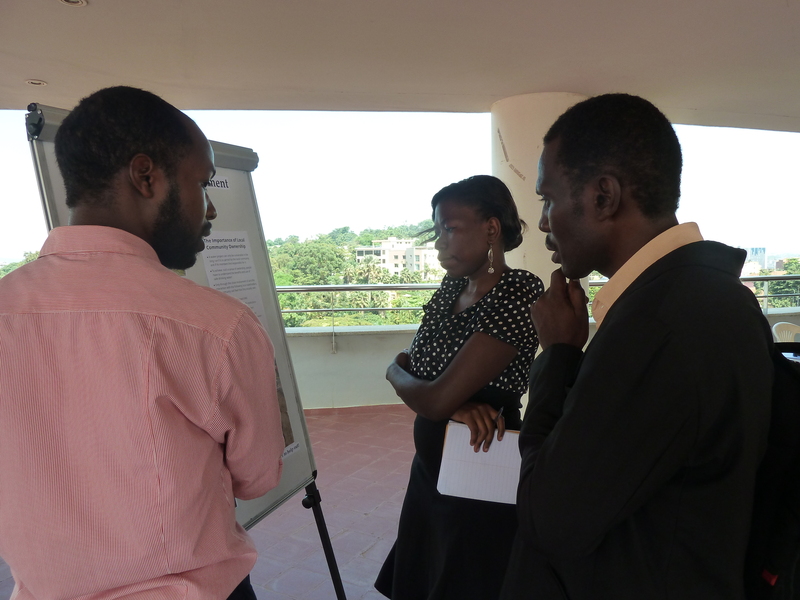 Within this framework, Fontes Foundation was welcoming participants of the symposium at an Open House event at our head office in Kampala. The visitors got introduced to the most important pillars of our water projects in form of an exhibition, including community involvement, monitoring and evaluation, implementation and maintenance as well as Fontes Foundation’s long-term commitment to its projects and beneficiaries. The Fontes Foundation staff was at the disposal of the visitors to give them more detailed information and to answer their vast amount of ques- tions. Participating in the Kampala WASH Symposium and hosting this Open House event was a great opportunity for Fontes Foundation to interact with a large variety of stakeholders such as governments, civil society organizations, the private sector as well as academia, to increase the organization’s network and to establish new potential partnerships. 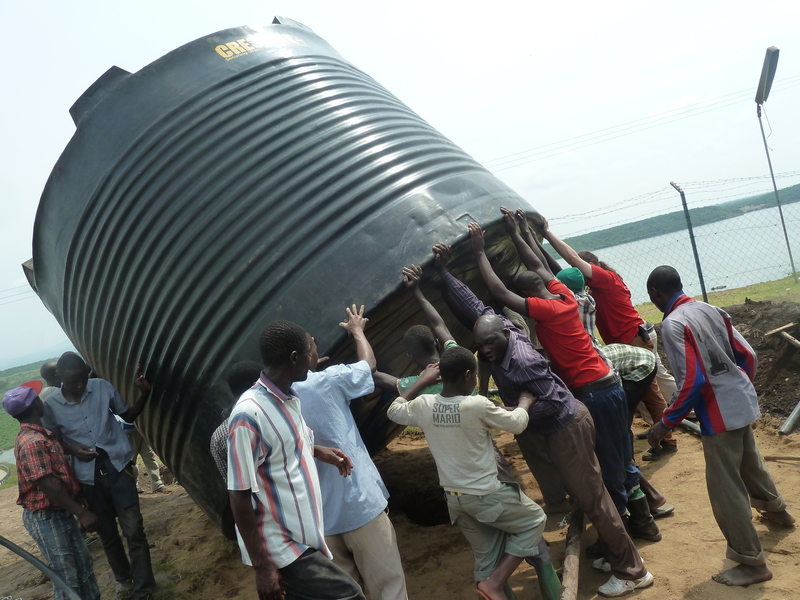 Installed in 2011, the Safe Water Project in Katunguru-Kasese is Fontes Foundation’s biggest water project, serving approximately 2,000 people. Due to the rapid population growth and the increased demand for safe drinking water resulting thereof, Fontes Foundation, with the generous support of Lions Club Oslo-Slemdal (Norway), carried out an extension of the current water system in January 2016. The newly constructed second water tower with the elevated storage tank. To guarantee that the water pressure is high enough for further water system extensions in the village, an additional steel water tower has been constructed and connected to the old one, with the result that the whole water system is now on high-pressure connections. In addition, a second settlement tank has been installed to further increase the production capacity of the system. 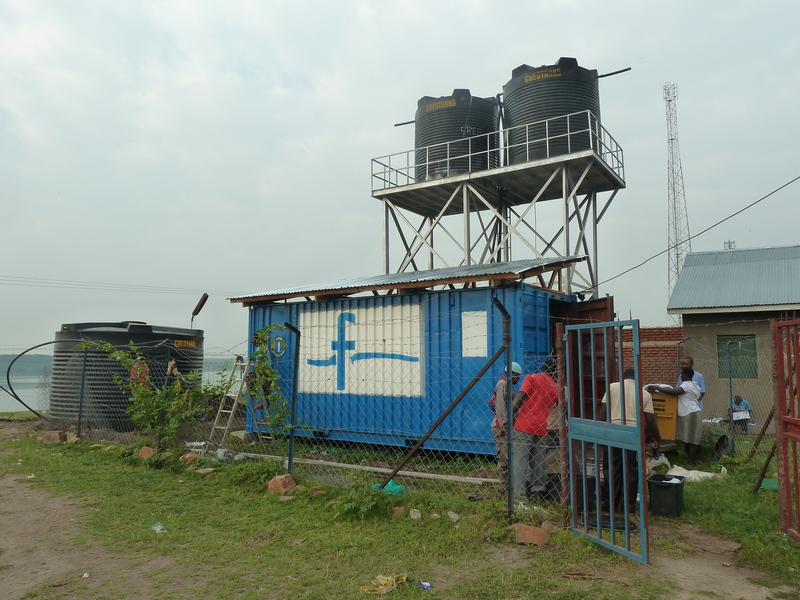 Besides the installation of new hardware, the already existing water treatment container has been reworked by installing a proper iron sheet roof, fixing and cleaning up the inside and painting both the in- as well as the outside of the container. With this extension successfully put in place, the Katunguru- Kasese water committee will be able to cover the increasing water demand of the village in the future. The urgent need for increased access to water, sanitation and hygiene (WASH) services has been a continuous issue on the global development agenda since years. Although promising developments have been achieved, such as the improved access to drinking water for 2.3 billion people between 1990 and 2012 (cf. GLASS Report 2014), the supply, especially in rural areas, is still inadequate. 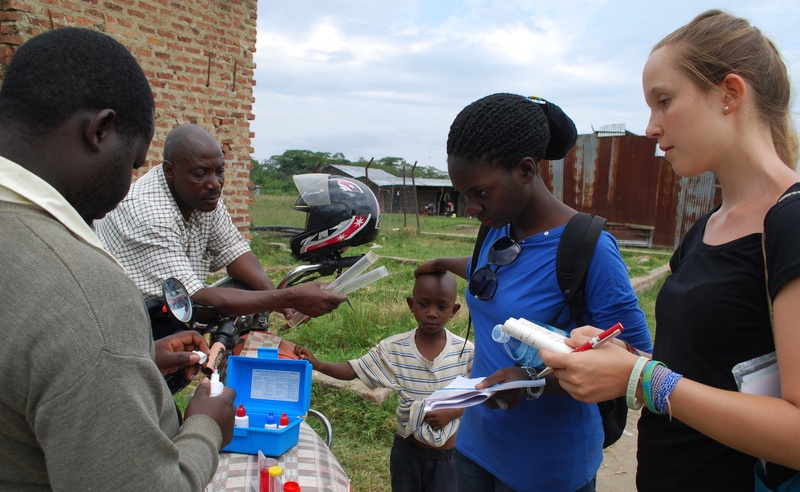 Fontes Foundation is addressing the problem of inadequate access to safe drinking water in rural southwestern Uganda since 2004. To find out about our projects’ performances and obstacles, Katharina Stegelmann conducted a research study during three months. By analysing the project’s accountability and monthly reports of 2015 as well as by conducting interviews during the recent follow up in May 2016, she discover challenges regarding project management and data collection, but also revealed promising trends. According to the current committees, the challenges encountered are various and range from financial difficulties to problems related to the lack of knowledge, commitment and communication. Furthermore, the projects’ performances depend highly on the seasons. During the rainy season, water users tend to fetch rainwater for domestic purposes. While demand decreases within this period, the chemical usage increases as a higher amount of aluminium sulphate has to be added to purify the water. Figure above: Comparison of annual accountability of the safe water projects in 2015. 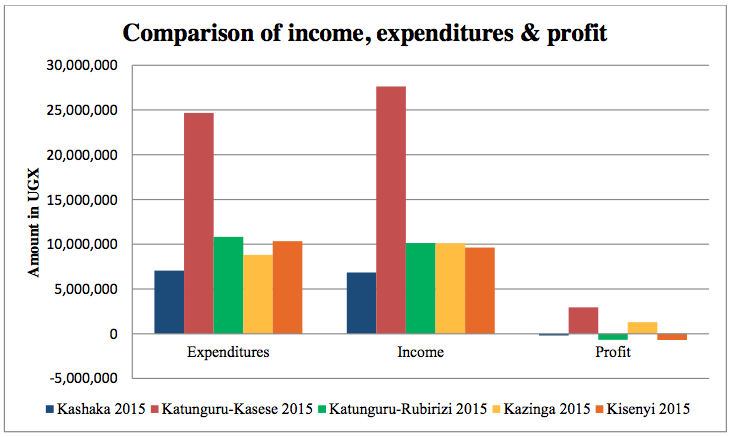 While the collected income highly depends on the season (the more it rains, the lower the income), the expenditures vary a lot due to fluctuation of maintenance costs. Demand de- creases during rainy season (as water users tend to fetch rain water), while the chemical us- age increases as technicians have to add more chemicals to purify the water. A further challenge is the high demand for power, either from the grid or produced by solar panels. While the demand stays constant, the supply varies as power cuts occur or the energy produced by the solar system doesn’t meet the demand. Besides this, the research identified deficits in relation to data collection. The study revealed that monitoring tools (e.g. monthly report forms) need to be adjusted to the projects’ individual circumstances and the submission of the forms should be taken more serious by the water committees. Besides incompleteness and inaccuracy, caused by vague or neglected monthly reports, adequate accountability has been identified as a core challenge concerning data collection. To improve the monthly data submission and strengthen the management skills of the committee members, further capacity buildings are necessary. As all committees showed deficits within their general management, mostly caused by a lack of communication or the misplacement of important documents, this gap should be addressed by constant follow ups. Furthermore, the awareness within the community about the importance of chemicals, such as chlorine and aluminium sulphate needs to be strengthened. However, the recent capacity building on responsible chlorination, which was carried out in April 2016, has already widened the communities’ awareness. One has to regard the fact that the five safe water projects are facing different circumstances in relation to their management, to the water source, which impacts the water quality as well as to their population size. These different conditions affect the project’s performances, which are dependent on internal (e.g. commitment of the committee, financial support by the community to maintain project) as well as external (e.g. water condition, donations from donors) factors. The research has clearly revealed that solar panels impact income, expenditures and profit. In the village of Kazinga for example, after having installed the solar panels, the project was able to increase the current revenues, balance the expenditures and make a profit within one year. This development is promising, nonetheless, the Kazinga project was reliant on power produced by generators, while the remaining two non-solar projects (Katunguru-Kasese & Katunguru-Rubirizi) have a power connection, which is more economical in their case. To ensure a responsible and secure maintenance of our projects, Fontes Foundation will continue guiding and financially supporting the water committees, since their means are only sufficient for minor repairs, but not higher maintenance costs. As Fontes Foundation Uganda ‘envisions empowered communities, able to collaborate for the common good, develop themselves and realize their potential’ constant monitoring and evaluation plays a crucial role in discovering and addressing challenges, as well as ensuring sustainable development and community involvement. 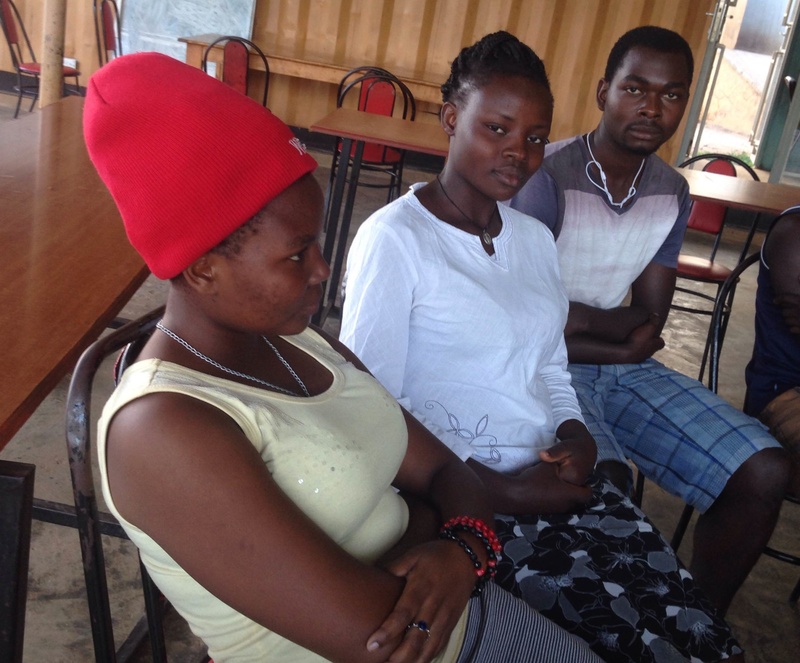 The Potentiam Youth Centre (PYC), as opposed to regular vocational schools in Uganda, addresses the lack of focus on building the youth’s entrepreneurial and personal development skills. Last year, in order to explore the actual impact our specially designed courses have on the livelihoods of disadvantaged youth, a pilot study was conducted. 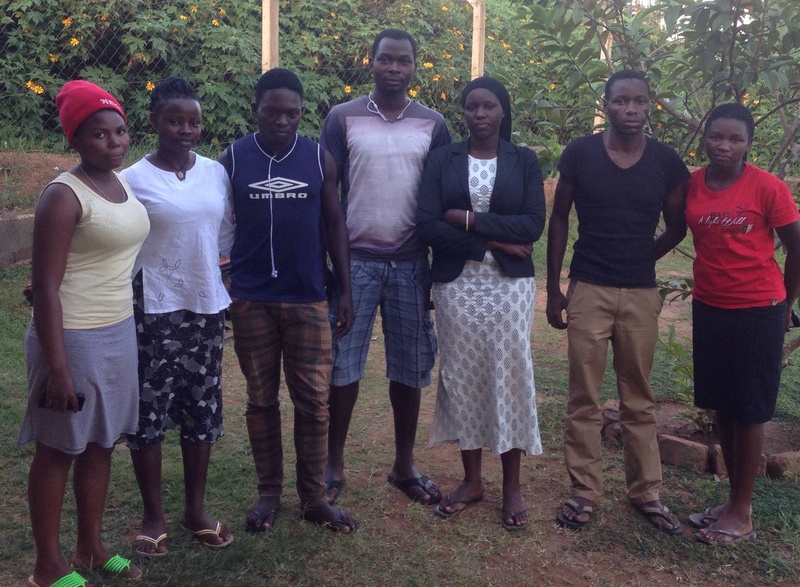 After graduating high school, Abdul Karim, one of our scholarship students, was enrolled in the core course of our Youth Centre, instead of putting him into a vocational school. This allowed us observing how the PYC affected his attitude and the overall performance during and after the course. Having gone through the intense training of the PYC, today, Karim is one of the strongest characters of our scholarship project and a success story to the PYC. Right after finishing our course he got a foothold in the professional life. He is currently working as a marketer for a furniture company in Kampala, while at the same time completing an evening course at vocational school YMCA. The new scholarship students show a great level of commitment and are highly motivated. Their self-confidence has risen significantly within the last two months. Karim used the skills and the self-confidence he gained through the Youth Centre to develop his own personal goals and to pave his professional pathway. Completing an evening course at the vocational school in ”Wildlive and Tourism”, while simultaneously working as a marketer to make a living just shows how much ambition and dedication he has gathered through the PYC. The pilot study clearly revealed the positive impact and strong transformative power the courses at our Youth Centre have on the attitude and employability of our students. We strongly believe that the PYC, as compared to the academic pathway, does make a difference in that it actually prepares young people in an effective and practical way to get a livelihood. This is why our scholarship students, who completed a vocational training at the YMCA, were offered the opportunity to benefit from the PYC like Karim did. Together with three other scholarship students, who recently graduated from high school, four of the YMCA graduates joined our core course. So far, they are doing great and already seem to have personally developed and grown considerably. Our core course is structured around Business English, Entrepreneurship and ICT classes, while Personal Development is at the heart of our education curriculum. Students receive personal mentoring and are taken through a number of courses to change their attitude, increase their work ethics, develop their self-awareness, give them a sense of direction and help them strengthening resilience, while improving their focus and effectiveness. They are taught how to invest in themselves and create a personal vision, so that they are able to manage themselves effectively regardless of whatever life might bring. Instead of waiting for things to happen, they learn to be confident, take risks and actually make things happen. Even though they might not always achieve all of their objectives, they will experience a richer and more rewarding life, by committing to pursuing their dream. We are convinced that this commitment to pro-actively work on creating their own future is the first step on the path to their personal fulfilment. To sum up, with our specially designed courses at the Youth Centre, we are aiming at making a difference by allowing disadvantaged youth to move out of the programme well grounded so that they are empowered to face the challenges life will throw at them in their endeavours.